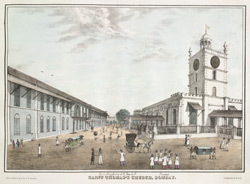 bl.uk > Online Gallery Home	> Online exhibitions	> Asia, Pacific and Africa Collections	> Saint Thomas's Church, Bombay. Plate five from J. M. Gonsalves' "Views at Bombay". This Church was designed by Gerald Aungier and built between 1672 and 1718. The See was established in 1833. One of the most noteworthy aspects of the Cathedral is the number of monuments contained inside which includes Bacon's monument to Governor Jonathan Duncan. Duncan himself is buried under a pavement in the nave. In the chancel on the left-hand side is the tomb of General Carnac, Clive's second-in-command at Plassey.